1. 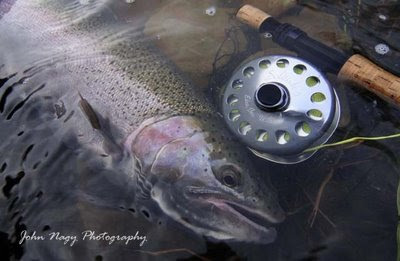 The drag must function properly and the reel cannot lock up or free-spool when the air temperature is below 32 degrees F. and when the water temperature is near freezing. 2. The finish on the reel must protect it from the rigors of steelhead and salmon fishing; exposure to stones, sand, boat gunnels, water loaded with ice and sediment, pick-up truck beds, etc. 3. The spools need to be easy to change. 4. The reel needed to be lightweight to reduce casting fatigue. 5. It had to be low maintenance. 6. 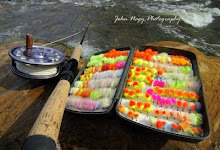 The reel should be able to be operated with gloves on - oversize knobs. 7. 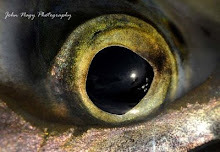 There should be no shapes or objects on the reel that could catch the line or tippet. 8. And, most importantly, the drag must have a zero start-up inertia to let the drag engage instantly and apply constant pressure. A drag that intermittently sticks/slips means lost fish. John Nagy uses the Harris Solitude Large Arbor V (8.5 oz.) with his custom 10 1/2 foot steelhead "noodle" fly rod. It has the right amount of weight to balance this long fly rod. The Harris Solitude III and Solitude IV are ideal for shorter/production steelhead fly rods. In 2005, the Harris fly reel production facilities were sold to Edco (www.solitudereels.com) and moved from Michigan to Mount Vernon, Washington. Edco will continue the “guides reel” tradition laid down by the Harris Reel Company by offering and improved version of the out of production Harris Reel (considered by many to be the best steelhead reel ever made) called the Solitude. The Solitude drag system is silky smooth with multiple settings on the light end to protect lighter tippets, has zero start-up inertia, delivers even and consistent pressure during the fight and performs extremely well during freezing conditions due to its sealed design. The new Solitude design has a reversible drag created to facilitate right and left hand reel conversions. Also, manufacturing tolerances have been tightened to improve fit between the spool and housing. Presently, the moderately priced Solitude reels come in four models (standard spool sizes) with two large arbor designs and a spey size reel due out shortly. 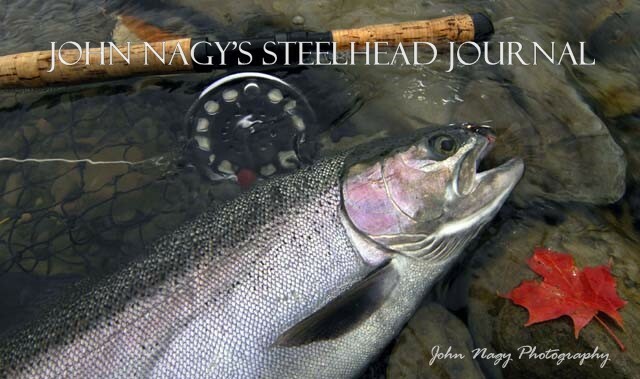 If interested in ordering a Solitude fly reel (and/or John Nagy Noodle Fly Rod) please contact John Nagy at steelheadguide@hotmail.com or (412) 531-5819. Please visit www.solitudereels.com for more information on this reel.